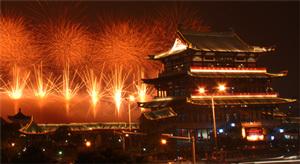 The Fireworks Firm Ltd is helping to represent the UK at the prestigious Chinese competition held in the Hunan Province. Changsha is the Capital city of the world for fireworks and on 25th of February 2012 (Saturday night), the team will be preparing to fire over 3,000 shells mostly 5", 6" and 8", including many 10" and 12" shells in this show. Did you know the biggest shells used on New Year's Eve at the London Eye was 6" shells, so this show should be amazing. 52 teams from around the world will attempt to produce the winning show. The Team leader for this show is Chris from Celtic, including help from many other firers from the UK, making it a truely UK show. Keep an eye out for the winners and we hope the best team wins!